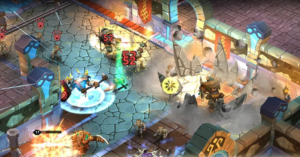 Dungeon Legends is an exciting role-playing action game similar to Diablo. 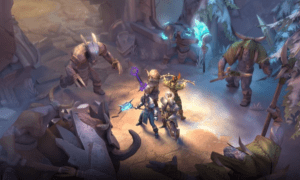 You just need to download Dungeon Legends to hone your tactics of battle and find yourself in an incredible magical world inhabited by dwarves, elves and a variety of monsters. You have to play for the gnome, who will leave his hometown in order to find gold and bring it back to his homeland, thus gaining honor and respect among his people. You can develop your character in three different directions so that he becomes either a warrior, or a healer, or a defender. In order to choose one of these directions, decide from the very beginning before you start the game. The gameplay is very simple: you will travel through the dungeons, fighting with dangerous enemies who will stand on your way, and “pumping” your skill. Winning, you will receive a reward and experience and become even stronger. And, having spent coins in a game store to buy weapons and equipment, you can be sure that your hero will become almost invincible. But still, it’s not so easy to defeat all enemies, so you can team up with any other player by choosing the Co-op mode. You can also unite with the whole clan, but then you will play to control all the dungeons – the reward will be very high. You will fight in real time. Among other things, the game has a PVP mode that allows you to hone your fighting skills. Also, every week, you can see tournaments and other interesting events. The game has quite simple controls and good, high-quality graphics. Darkness Rises is an amazing role-playing game. In this game, users need to take control of one of the heroes who is trying to kill the sinister centaur. The problem is that he has a huge army that will disturb you on the way to the goal. Choose a hero, learn all the necessary skills and engage in a dishonest battle with a huge army of undead and achieve your main goal. As you progress, you will receive the experience that can be spent on improving your hero. You can improve his physical performance, but also get new skills that will be extremely useful in battles. In order for users to effectively confront all sorts of monsters in large numbers, the game has quite convenient control. Due to this, users can destroy hordes of monsters, depending on skills, as quickly as possible. Also in the game, there are strong and awesome bosses. All bosses are unique and it’s hard to win them up. The exciting project Darkness Rises will delight users with high-quality and attractive visual design. Rogue Hearts is an excellent military mobile game. Studio Ninetail Games has managed to create a high-quality project with beautiful graphics and an exciting storyline. In the beginning, you need to choose the main character. The characters differ in appearance and characteristics. Then you will be transferred to the first location. This is a green area with trees, stones, buildings. Throughout the game, you will fight with various enemies. They are represented as humans, dangerous wild animals, and various monsters. For killing enemies, the hero gains experience points. Raising the level, you can pump the basic characteristics of the character. You can also periodically get valuable and useful artifacts. They will simplify the process a little. Don’t forget to use special skills. The controls are intuitive, but you have to spend some time getting used to it. It consists of a visual joystick and a few buttons. The gameplay is quite exciting, interesting. The gameplay is accompanied by an exciting storyline. The graphics are commendable, especially for visual effects. Discover a completely new fantastic world. The player will have to complete a huge number of quests and additional tasks. Exiled Kingdoms RPG is a role-playing epic with an impressive storyline and a cruel medieval atmosphere. You have to discover the main secret of the game, but for this, you need to explore all new sections of the map, meet other characters and perform tasks. For the successful completion of quests, you will be given unique gifts and skills for the character. In addition, on your way, you will meet bloodthirsty monsters and dangerous enemies, which you can only win with a special weapon. Don’t miss your chance and use every opportunity to pump the character and replenish its arsenal with unique weapons of terrible destructive power. The free version of the game is constantly updated. 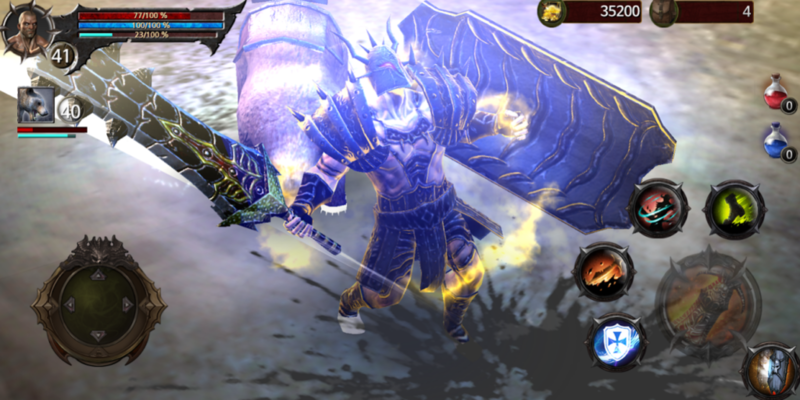 The game features a classic for this genre design and simple controls since Exiled Kingdoms RPG was specially created for mobile phones and tablets. All actions are performed with a few clicks or a simple touch to the screen. The game can be downloaded for free but contains additional paid content that expands the gaming experience. Dungeon Boss is an addictive RPG strategy game in which you can develop many characters, improve their skills and create your own army to face off with the most powerful bosses. Getting bonus points, you can gradually replenish your army with the most powerful characters, and even mythical heroes with special abilities. Remember that your team must be the strongest so that your dungeon is reliably protected from enemy raids. In the game Dungeon Boss, you can also cooperate with other players and create your own guilds to cope with the most powerful opponents. Raid enemy dungeons and take part in daily battles to get the maximum points and unique gifts that will further strengthen your character. The application has its own chat for faster and more convenient communication between players. A distinctive feature of the game is high-quality realistic graphics and almost endless gameplay that will help you to plunge into the fantastic world of battles. Iesabel has every chance to compete with other representatives in choosing the “best portable Diablo”. 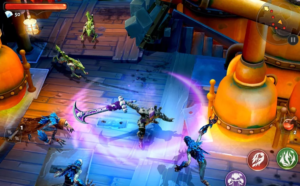 It looks nice, skillfully repeats what we love Diablo for, and adds some nice bonuses – first of all, cross-platform multiplayer. Iesabel is a multi-platform project. You can play it on your smartphone or tablet, or on a PC, and play in a cooperative mode, exterminating the hordes of the undead with the support of your comrades. Secondly, there is (by genre standards) a good storyline and three levels of difficulty. Mysterious and diverse locations, ranging from caves and marshes, ending with forests and villages are impressive. So with Iesabel, if desired, you can spend a lot of time. A bright, unpredictable plot, a huge world in which game events will take place, as well as detailed, high-quality graphics, make this game a real masterpiece. The game contains a wonderful soundtrack that harmoniously fits into the atmosphere of this RPG. A unique game BloodWarrior from the first minute will capture your attention with its exciting plot and high-quality 3D-graphics. As soon as you enter the virtual world, you will be able to release all your anger at malicious enemies. Are you ready to show your courage and composure? Then install the game and go to meet unknown worlds filled with danger! Your character is completely ready for battle, because he is equipped with all sorts of objects, and has different skills. The game will be so intense that you will not be bored for a second! The game has 2 modes of difficulty, so you can choose the most acceptable for yourself. In each mode, there are more than 90 different levels available. 10 kinds of pets are ready to help you achieve victory and become your reliable companion. Tests occur in three different modes. During their passage, you will be able to receive additional rewards and upgrade your equipment. Only the strongest is worthy of winning the first place among all the players! Who if not you? The Angel Stone RPG app is a multiplayer action project that allows players to save the world. According to thousands of players, this game deserves the attention of those who want to spend time in a dynamic and colorful game where you can pump characters and enjoy the original storyline. Now the game Angel Stone RPG is considered one of the best role-playing Android games. Although there is nothing alive on earth, it is in your power to revive everything, freeing the planet from evil demons. To do this, you must fight the main boss of the demons and defeat him. This will give a chance of complete liberation of the land from enemies. If we talk about the technical characteristics, here is fairly simple gameplay. Initially, you need to choose one of three heroes: a shooter, a magician and a warrior. Here the choice will depend on your preferences. And then successfully pass the location, and destroy hordes of monsters, after which you will open new levels. There are more than a hundred different skills, as well as more than 60 interesting levels. So download the exciting Angel Stone RPG game and fight demons and monsters! You will find cool graphics and unusual soundtrack! This game is one of the best games that has a likeness to Diablo. The mighty and strongest kingdom was surrounded by nasty monsters. These terrible monsters want to destroy the city, killing its inhabitants and destroying houses. Only our hero can change the situation. Dungeon Hunter 5 is the most dangerous journey which begins in the besieged fortress, where we get the first task – to find and destroy the traitor who dared to steal the strong artifact needed by the city. At this time, in fact, the player is trained in the management and subtleties of the game. The hero is not defined in any class, as is customary to see in all sorts of fantasy games. Instead, the player is offered a choice of five types of weapons. 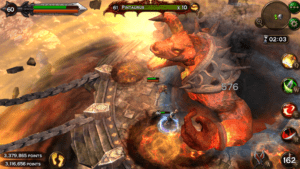 The graphics in Dungeon Hunter 5, as in previous versions, at a height. The bloody slaughter with maximum detailing and the monsters around are well developed in terms of movements. Management implies not only a tactical attack but also the ability to repel attacks and dodge them, which makes the gameplay more alive. The game has a nice music accompaniment and excellent sound effects. 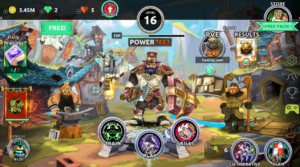 Nonstop Knight has become one of the most popular games of this genre in 2019. All this is due to its advantages, such as, for example, a dynamic gaming RPG process, and others. All of them seemed really intriguing long before the release of the application. And as a result – the expectations were justified, it’s no wonder that today the application is extremely popular. The gameplay is clear. These are all the same battles, but how it all looks already says a lot. Design and easy management with just one finger, these are not all the advantages of the application. The game is just addictive, so be careful when planning your time. The player will play the role of a brave knight. He will destroy his enemies in the form of fantastic creatures. Bosses will appear at the end of each story. Obviously, it will be much more difficult to cope with them and you will have to use unique skills. For the destruction of enemies, you will get gold. It should be used to improve your character and weapons. New skills can be specifically used to defeat rivals and bosses. As a result, each victory will bring the hero to the top of the ranking and a variety of rewards and bonuses will be given. Diablo resolutely follows in the great tradition of western fantasy, full of portent, seriousness, and grim tragedy. But there’s a lot to be said for the more light-hearted approach of Japanese RPGs, and the Zenonia series marries their freedom and sense of fun with the traditions of the hack ‘n’ slash genre. This is the legendary RPG. The main advantage is a developed world, a lot of monsters, interaction with other players and the absence of critical bugs. The game is about 10 years old, but still, there are few games that can compete with it. Of course, the graphics aren’t the most modern, but it looks good. This game gives the player the opportunity to fight with different monsters. They aren’t only in the dungeons but also in other locations. For battles you need to use special abilities that any character has. 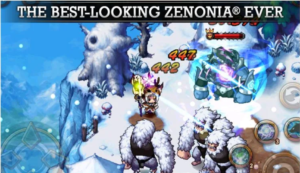 The battles in ZENONIA® 4 are really interesting because you need to think about how to behave during a fight. It’s not enough just to press the buttons, you need to think through each step. There are also battles with other players. Here you need to think even more. After all, it will be extremely difficult to hit the opponent. All the characters are very mobile, it’s easy for them to dodge enemy attacks. In this game, it’s possible to pump your character. One of the coolest sci-fi games is Arcane Legends MMO-Action RPG. The main character will pass through huge underground worlds, where he will be able to fight with other participants and monsters. Look for treasure and even become a member of one of the guilds of heroes. You will have many types of armor, weapons and even animals. In addition to the underground passages, the player will be able to find himself in medieval castles, dark and dangerous forests. Be ready for the battle with the goblins and dragons. Everyone is trying to harm your clan and the whole kingdom. If you download Arcane Legends MMO-Action RPG on Android, you can take part in epic events once a week. A player can sometimes catch exclusive items and things. With their help, the hero will get unique abilities and significantly improve his skills in battles. In total, there are three classes of pumping hero with a variety of skills. You can use your strategy to make a unique warrior. Use the found and conquered items to change the look of your fighter. It will be great luck if you find a fantastic kind of animal. Together with it, you will easily pass the coolest quests. Choose a multiplayer mode to meet with other participants in the war and organize your guild together. Then it will be easier for you to deal with powerful dragons. You can choose any of the three game modes. This may be the capture of an enemy control point, a boundless duel, or simple one-on-one battles. This is an RPG project in which a player can not only complete many tasks but also fight with other players, communicate with them and create his own guilds. And even though there are some problems with optimization, it is still one of the best RPG projects on Android like Diablo. 4 characters are available to choose from. Each of these characters has unique abilities and characteristics. Each has 4 abilities and 1 basic attack. Each ability can be applied no earlier than after a certain amount of time. Most often, the intervals between use are no more than 10-15 seconds. For pumping, you need to pass single dungeons. There, you can meet the usual enemies, as well as bosses. Bosses are huge and strong, so fighting them will be very difficult. But if you don’t want to go through missions alone, then you can fight with other players. This can be done on a special PVP arena. Honestly speaking, at first, it will be very difficult to fight with other players. Live players are much smarter than artificial intelligence. In addition, in the PVP battles, the level of character pumping is taken into account, therefore, before battles with real opponents, you need to spend a lot of time on leveling. 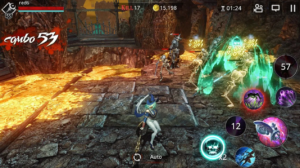 Eternity Warriors 4 is an exciting game. Here you can not only cut down crowds of stupid opponents but also unite with other players in the guild, communicate with them and arrange battles.